Social Welfare History Project Ball, Robert M.
Editor’s Note: Larry DeWitt is the public historian at the U.S. Social Security Administration. He is the co-editor of Social Security: A Documentary History (Washington, D.C., Congressional Quarterly Press, 2008). Two of Ball’s signal achievements on the Social Security policy front were the successful passage, in 1972, of the provision creating automatic annual COLAs (Cost-of-Living-Adjustments) and, in 1977, the enactment of a provision creating automatic indexing of the initial benefit to wage growth. These two program features ensure that a person’s initial Social Security benefit will reflect their standard of living at the time of retirement, and that this standard of living will be maintained through the preservation of the purchasing power of their benefits. These are among the most valuable features of the program for beneficiaries, and are major drivers of program costs for the Trust Funds (which is why some Social Security reform plans call for indexing the initial benefit to prices rather than wages—which would significantly lower benefits over time). While Richard Nixon deserves some of credit for advocating COLAs1 it was Ball who had been steadily supporting this idea, and it was Ball, especially, who understood the importance of the wage indexing provision. 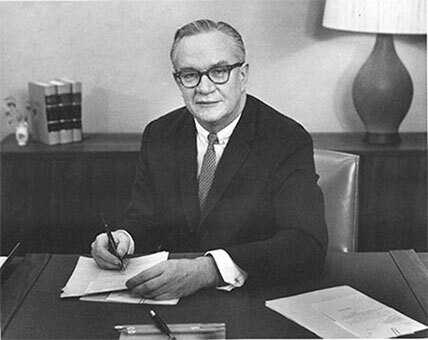 During the Carter Administration, Ball was their principal advisor on Social Security policy and in this role he was in just the right position to ensure that the wage indexing provision was adopted as part of the 1977 amendments. In 2001, I did a series of oral history interviews with Ball, which is when I really got to know him.2 Mrs. Ball (I could never bring myself to call her Doris, it seemed impertinent somehow—although Bob insisted I call him Bob) served as a kind of informal hostess for our sessions. She fielded the frequent phone calls, knowing which ones to deflect and which ones to interrupt us for Bob to take; she managed our time, making us break for lunch when she thought we should; and she even prepared our lunch each day. Our sessions thus had three parts: we would do a morning interview; break for a leisurely lunch; then do an afternoon interviewing session. The lunches were a high point in their own way. Mrs. Ball and Bob would charm me with stories from their long and rich lives; they would engage me with insightful discussions of current events and with anecdotes about people we knew in common; and, in general, shower me with the pleasurable conversation of delightful luncheon companions. I can still see in my mind’s eye Bob carving slices off a Bartlett pear and laying them on a piece of cheese—a favorite combination of his—as the desert for his lunch. Ball also developed his own detailed plan for the reform of the Social Security program. His plan—which sought to save the traditional program—was updated each year as the actuaries released their latest forecasts, and the latest edition of The Social Security Plus Plan would soon be in the mail to those of us on his (rather large) mailing list. (Ball’s plan was also the basis for the reform proposal put forward in 2005 by Nancy Altman in her book, and it had to be considered by any serious student of Social Security reform) (Altman, 2005)3. 1Although both Nixon and Ball supported automatic COLAs, they did so for somewhat differing reasons. Ball wanted to protect the purchasing power of benefits, while Nixon (and some other conservatives) thought that by providing automatic COLAs based on an actual calculation of inflation rates that this would bypass the frequent political bidding wars over benefit increases, with the net result being lower program costs. So Bob was concerned mainly about the beneficiaries and Nixon about the budget—both of which were legitimate concerns, to be sure, but, as sometimes happens, this was a policy change jointly supported by people with markedly different motivations. 2These interviews are available online at http://www.ssa.gov/history/orals/balloralhistory.html, and more information about Ball’s career can be found at http://www.ssa.gov/history/bobball.html. 3The most recent version of Ball’s reform plan can be found online at: http://www.robertmball.org/. Berkowitz, E.D. (2003). Robert Ball and the politics of Social Security. Madison, WI: University of Wisconsin Press, 2003. Altman, N.J. (2005). The battle for Social Security: From FDR’s vision to Bush’s gamble. Hoboken, NJ: John Wiley and Sons.